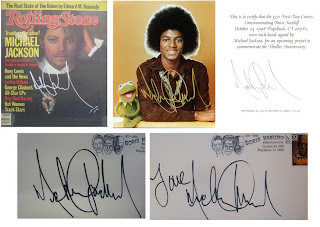 Signature Arts, Inc.: Michael Jackson autographs, be careful! Michael Jackson autographs, be careful! It’s come to my attention that there is a flood of very good but not authentic Michael Jackson pieces being sold. With the very hard work of authentication community we have started the breaking up of a very large ring of non-authentic items. We did catch these early so they have not got out of hand yet but would probably get by a lot of dealers and some authentication services.What I will do here in this article is show you what the non-authentic ones that are being mass produced look like. I won’t tell you what makes them not right as then the persons doing these will try to fix it. We do know the origin of where these started coming from and are working on catching the people red handed. To the common collector these may look authentic but they are not. They are all signed by the same person and in my expert opinion do not believe it is Michael Jackson. These are not being sold a little bit at a time either. These are being sold sometimes in big lots and you have to buy all or none for prices that are just to low to believe. If you have any doubts whatsoever contact a dealer or authenticator that you have a relationship with and ask their opinion. It might be the best $15 you ever spend. Authentication Stickers Affixed by Morons?